Edges of the timbered land lived an always uncertain future as the banks of the muddy Salt Fork River were subject to crumbling into the ever moving waters. On occasion during spring rains giant pecan trees were dropped into the raging floods as easily as a child's straw plopped up and down in an icy cold drink glass. The up rooted major trees rolling and tumbling along the depths of the swirling eddys made a statement as to its power. On the other hand when again the slow stream was quiet and moving gently along there was nothing as peaceful. The large wide sand bar there became a place for weiner roasts, picnics and a play ground for their family. In an isolated shack of a house at the beginning of the timber an elderly old hermit like man lived and we shall call him Tom, for in fact, this was the only name they knew for him. Tom was probably, close around the age of 79. However, if one had to guess his years they would say more to fifty or fifty five years. He was muscled in about his arms and chest with a leanness telling of the good life he had lived. He was a small crop farmer and committed no crimes against his body. One never saw a lamp lit in his little shack. He was in bed before the dusk of evening turned to darkness. Tom had fished the river in a small boat in many different ways, once with nets, another time with rod and reel, still another time with a poled gaff looking something like a devil's pitch fork all set with sharp prongs not to allow a fish to slip off once he had thrown it and pierced the darting creature. Like a hovering good angel he always seemed to be in and around the area of the wandering meandering river and the family with their children who lived across the road from him. The children were advised and warned of the dangers of the lands so they were inculcated with the need to exercise care in the way they lived there. They knew when they lifted the large melons from their place on the vine it was necessary to roll them over first, carefully. Sure enough under each melon was the large black spider with the red hour glass on it. The water mocassin snakes were as deadly as any prairie rattler even if they did keep to themselves in the edges of the river. Even when the river was moving slowly and peacefully along the children were warned that there were deep holes into which they could all at once step. Sometimes, at the bottom of these holes there was the fine silt like quick sand which could grasp them and pull them into it. At one point where two rivers came together they were told seventeen persons had perished there in the depths of the turning tornado like whirlpool. The area was so deep when that person was pulled under by the twisting waters they sometimes became confused by the swirling and darkness of the waters maybe swimming down deeper to perish. There was another danger they were told about and in their child like mind they rather doubted this story since it was something like a monster tale because it spite of all the dangers the beauty of the country could not be denied. It was peaceful and removed from the busy community made that way simply by the rough timber there, remote because of the way the river turned and held the land. The monster story was that to tell of the unusually big fish to live under the ledges of the banks of the river. They were the Flat Head Catfish. Fishermen told fish stories about the creatures of how they could actually pull a boat when caught and so many others the children became somewhat skeptical of the fishermen's credibility. With a happening to be compared to the jerk of a fishing line the children were once and for all convinced of the truth of the stories told. This was a particularly lazy Sunday afternoon. The little family was enjoying a picnic lunch on the sandbar. Their baby sister played on a blanket spread there and they waded along the shallow banks. As the water pulled and tugged gently at their feet the mystery of their sinking into the sand and having the tiny waves playfully lap at their toes the wonder of what was a bit farther on out was denied to them by their mother's close supervision. Farther on down the river Tom was practicing something they had never seen before as to his fishing skills. 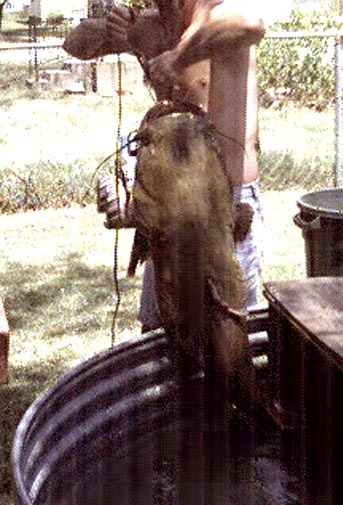 He was what was called, "noodling." This is a practice of a swimmer diving under the water to the depths of the rivers banks. Apparently, these are where large fish rest during the day. He would disappear under the water and in a little while come up out of the water holding a sizable fish in his hand. "Dad," their mother called to her husband. "You know, I think Tom's been under water too long." Their father was instantly alert and up to the high bank of the river. He ran along the edge and when he came to the place where Tom was last seen. He dived into the deep water. The churning of the water where he was told them, something was happening under the water. All at once the two men surfaced. Tom was holding with every bit of his strength to the mouth of the huge fish and their father was holding to the tail of the creature. Between the two they wrestled the huge monster to the shore. Needless to say, the children were from then on, believers in the presence of the giant fish living in the waters of the Salt Fork River.